Raise your hand if you ever had something you set aside, and couldn't wait to eat it/drink it when you got home from work only to find your husband consumed it. Uh huh. That happens here all of the time. It especially happened when I received a case of Cheribundi's Refresh line to try out. I seriously only had 3 out of the 12. But I AM impressed with the Cheribundi Refresh line up. They are not a protein drink or any type of product that promises muscle recovery after a workout. They ARE a great refreshing drink you can enjoy anytime of day. They are light and sweet, almost like a lemonade or ice tea drink. 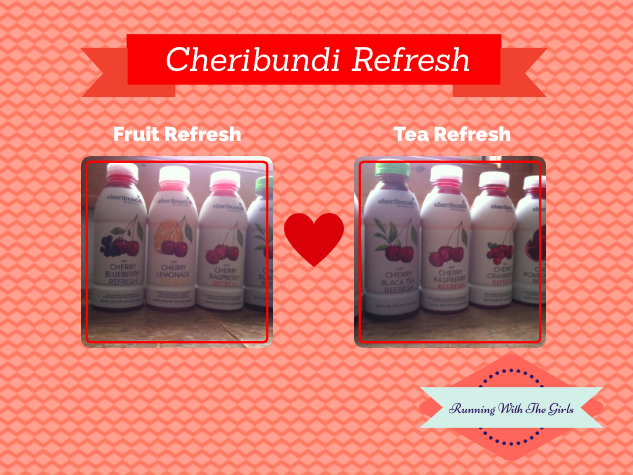 Cheribundi Refresh comes in Fruit Refresh flavors and Tea Refresh flavors. What I can definitely tell you is that they did not last long in my house at all. In only a matter of a few days, they were gone. I was eyeing up the Cherry Pomegranate Drink and before I new it, it was gone. However, the fact that they disappeared in no time at all is enough evidence that they rock! Even in the dead of winter, when you want warm, cozy drinks - these REFRESHing drinks disappeared fast! Now I only wish winter would disappear that fast! Each bottle of Cheribundi Refresh has 20 cherries and is 100% natural. And they are certified kosher and gluten free! Cheribundi is available in retailers throughout the United States. Not sure if your local store has Cheribundi, you can definitely check it out here. I’m a little bummed that my local Hannaford does not carry the Refresh line, but they do have the original Cherry Juice - which I do purchase from time to time. I do love the taste of cherry and having more cherry drink options makes me even happier. 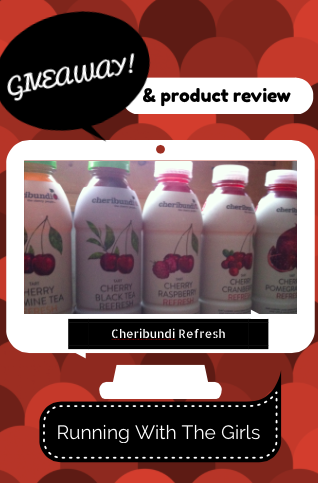 Now, for your chance to win you own Cheribundi Refresh! The giveaway begins tonight and will run through January 14th. Enter below. Cherry blueberry or cherry pomegranate!! num! Cherry Black Tea or Cherry Pomegranate! I love tea in every form and LOVE pomegranates - one of my favorite fruits! Cherry Black Tea sounds delicious! Love cherry anything, so any flavor would work. Would love to try the cherry pomegranate. I'm obsessed with pomegranates. They don't last very long in my house. I always clean at least 3 at a time and there's always a spoon in the bowl waiting for me to make frequent kitchen stops for a spoonful! Cherry pomegranate. For some resason that is all I want to drink (the POM stuff) so I really want to try this stuff too! Cherry Blueberry Refresh sounds SOOO good. I've honestly never heard of these befpre now. I'm checking my local stores right now!! These sound great! I've had their cherry juice before but I think this sounds even better! I want to try the Cherry Lemonade. Love Cheribundi, but have never tried the refreshers! I'd like to try the Cherry Lemonade or the Cherry Pomegranate Black Tea. Cherry pomegranate refresh would totally hit the spot I think! Yummy! Cherry blueberry looks really good! The refreshers sound great! Cherry lemonade or the Cherry Cranberry! I love Cheribundi, but I haven't tried the Refresh line. The cherry cranberry sounds amazing, as does the cherry green tea refresh! We love Cheribundi! I think Wegmans carries some of the Refresh line, we definitely have the original in our stores. I'd love to try the cherry lemonade one! MMM Cherry Pomegranate sounds like the best of both worlds what a sweet giveaway! P.S. All my treats that are supposed to be for me get eaten or drank too! Cherry Green Tea would be tasty and healthy! Let me know below which flavor you want the most! Cheery Pom sounds the yummiest! Cherry Black Tea sounds awesome to me! Thanks! Cherry lemonade sounds really good! The Cherry Blueberry sounds yummy! Cherry Blueberry would be divine! Cherry Black Tea sounds good.. actually they all sound good! They all sound great! But If I had to choose which one I would want to try the most, it would have to probably be the Cherry Black Tea! The Cherry Blueberry would be lovely as I love blueberries! I would really like to try the cherry lemonade & the cherry black tea! I have never even heard of Cheribundi, and if it helps with any sort of pain I am all for it! I would like to try the cherry raspberry or cherry lemonade. if it can help belly fat or joint pain am all for it. Sadly will never be able to find in my small town! Cherry Blueberry sounds good. or Cherry Lemonade. Thanks for the chance to win! These look delicious! I wish they would come to Canada! I'd like to try the cherry lemonade! I think I'd like to try the Cherry Blueberry the most. I'd like to try the Cherry Pomegranate the most.